These are so cute! Kids Personalized St. Patrick's Day Raglans $13.99 (Retail $28). Don't let your little ones be caught without their green! 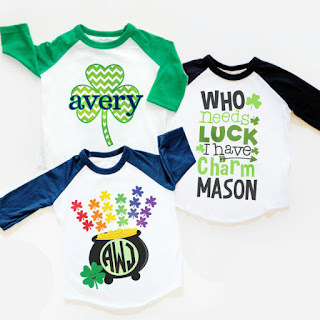 With our fun designs, they will love having a personalized raglan shirt for St. Patrick's Day! $3.99 for the first item and $2.99 for each additional item. US only. Ships no later than Thu, Feb 8.